The article cited the examples of Fiona Shaw as Richard II at the National Theatre, Phyllida Lloyd’s all-female productions of The Taming of the Shrew at the Globe in 2003 and Julius Caesar at the Donmar Warehouse in 2012, as well as Maxine Peake’s Hamlet at the Manchester Royal Exchange in 2014. While the film industry is famed for its conservative outlook on gender and race – (see Idris Elba’s recent speech on the lack of diversity in television here), theatre is where unconventional casting is allowing actors and directors to explore more radical avenues. In an earlier interview for BAFTA, Idris Elba also advised young actors to keep an open mind both in terms of approaching characters and in terms of approaching their career. “Keep an open mind. This may seem like an obvious thing, but you are the vessel and then on top of you and added into you are these personalities that you have to portray…Throw away any ideas you’ve got and start building a character from the beginning. [Also], some actors starting out have this idea that they want to be movie stars and on TV but I started out in theatre and ended up in television…The theatre route just opened doors for me. As an actor you can do voiceovers, read scripts, read plays. Get as involved as you can without being too choosy about the kind of work that you do. It’s just really great to get your performance and creativity out. Many actors have found that Audition Doctor have given them the opportunity to get their creativity out. Whether they are preparing for auditions or between jobs, the work that comes out of the sessions is vital for keeping their options open. Elba went onto advise young actors to “have an attention to detail” when it came to observing the emotional and psychological reactions of human beings. Audition Doctor allows actors to put their observations and creativity into practice. The sessions are focused and at times exacting, however, all of Tilly’s students have credited the ambitious level of preparation that is expected of them as being an integral part of their development as an actor. 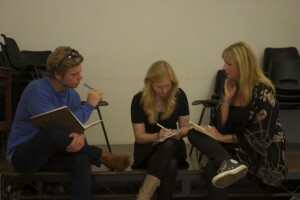 Many drama school candidates and professional actors attend Audition Doctor sessions in an attempt to unravel Shakespeare. For some of those applying to drama school, Shakespeare represents a hurdle to overcome as opposed to a weapon in their arsenal. However, it is clear that Shakespeare plays are increasingly giving actors more opportunities to play the atypical and avoid being pigeon-holed. Competition for these kinds of roles is fierce and many have found that the space, time and guidance that Audition Doctor provides is an integral part of their preparation to getting the part.